This title is out of print. For introduction to Managerial Finance courses. Guide students through the material with a proven learning goal system. Gitman’s proven Learning Goal System—a hallmark feature of Principles of Managerial Finance, Brief—weaves pedagogy into concepts and practice, providing students with a road map to guide them through the text and supplementary tools. The Brief edition provides an alternative solution for instructors who are especially pressed for time. 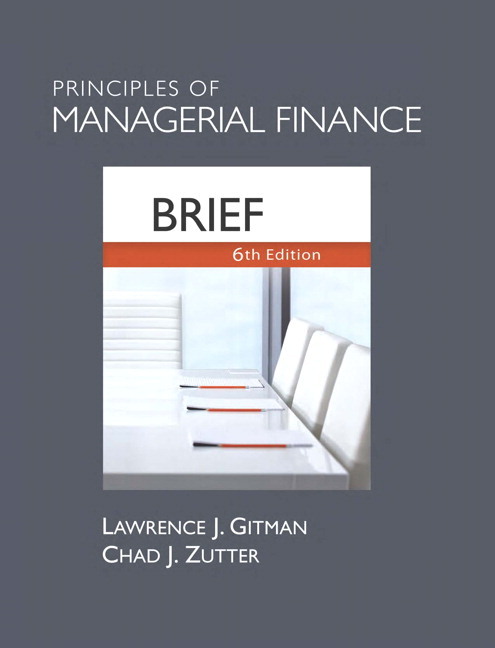 Just as thorough and effective as Principles of Managerial Finance, the Brief edition introduces a streamlined version of the fundamental concepts, tools, techniques, and practices. One Place for All of Your Courses. Improved registration experience and a single point of access for instructors and students who are teaching and learning multiple MyLab/Mastering courses. A Simplified User Interface. The new user interface offers quick and easy access to Assignments, Study Plan, eText & Results, as well as additional option for course customization. New Communication Tools. The following new communication tools can be used to foster collaboration, class participation, and group work. Email: Instructors can send emails to their entire class, to individual students or to instructors who has access to their course. Discussion Board: The discussion board provides students with a space to respond and react to the discussions you create. These posts can also be separated out into specific topics where students can share their opinions/answers and respond to their fellow classmates’ posts. Chat/ ClassLive: ClassLive is an interactive chat tool that allows instructors and students to communicate in real time. ClassLive can be used with a group of students or one-on-one to share images or PowerPoint presentations, draw or write objects on a whiteboard, or send and received graphed or plotted equations. ClassLive also has additional classroom management tools, including polling and hand-raising. Enhanced eText. Available within the online course materials and offline via an iPad app, the enhanced eText allows instructors and students to highlight, bookmark, take notes, and share with one another. This product is part of the following series. Click on a series title to see the full list of products in the series. NEW! Offer a new perspective: New Coauthor Chad Zutter. A recent recipient of the Jensen Prize for the best paper published in the Journal of Financial Economics, Zutter brings a fresh perspective to thirteenth edition of this text. 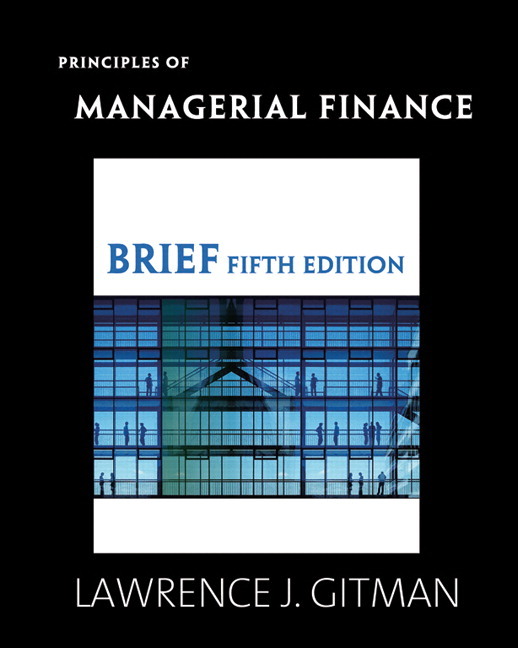 Together Gitman and Zutter incorporated contemporary thinking and pedagogy with the classic topics that Principles of Managerial Finance users have come to expect. Guide students through the material: The Proven Learning System. This edition has enhanced its learning goal system, which integrates pedagogy with concepts and practical applications. The system concentrates on the material students need to know in order to make effective financial decisions in an increasingly competitive business environment. The strong pedagogy and generous use of examples–including personal finance examples–make this text an easily accessible resource for in- and out-of-class learning. Help students make the connections: The Overarching Organization of this text conceptually links the firm’s actions and its value, as determined in the financial market. Each major decision area is presented in terms of both risk and return factors and their potential impact on owner’s wealth. A Focus on Value feature at the end of each chapter helps to reinforce students’ understanding of the link between the financial manager’s actions and the firm’s share value. Take the concepts abroad: International Considerations. In today’s world international considerations are essential to the study of business in general–and finance in particular. As in prior editions, discussions of international dimensions are integrated throughout the chapters, learning goals, and end-of-chapter content. For instructors who devote more time to international considerations, a separate chapter on international managerial finance is available at the end of the text. Why This Chapter Matters to You is a feature that helps motivate interest by discussing how the topic relates to the concerns of other major business disciplines and personal finance decisions. Personal Finance examples link the concepts, tools, and techniques of each chapter. Numerous examples of personal finance problems can be found throughout the homework material. NEW! Enhance the learning experience: New Features. New Chapter Sequence. While similar to the previous edition’s chapter sequence, the thirteenth edition contains nineteen chapters divided into eight parts. Each part is introduced by a brief overview in order to show students the collective value of the chapters in the part. The Matter of Fact! feature provides additional detail and interesting empirical facts that help students understand the practical implications of financial concepts. The In More Depth! feature–available on MyFinanceLab–offers a guide for further study. The chapter-opening vignettes and boxes are either new or revised in this edition and feature companies like or Facebook, Abercrombie & Fitch, and Best Buy. Chapter Cases with Automatically Graded Assessment. These cases have students apply the concepts they learned to a more complex and realistic situation. Group Exercises where students can work together in the context of an ongoing company. Each group creates a company and follows it through the various managerial finance topics and business activities presented in the textbook. Critical Thinking Problems, which require students to apply the various finance concepts and managerial techniques presented in the textbook. These are rigorous problems that are designed to test a student’s ability to understand the financial management situation, apply the necessary managerial finance concepts, and find the value maximizing solution. Numerous premium resources, such as an online glossary, digital flashcards, financial calculator tutorials, videos, and more! Offer information on ethics: Ethical issues. Students need to understand the ethical issues that financial managers face as they attempt to maximize shareholder value and to solve business problems. To that end, every chapter includes an In Practice box that focuses on current ethical issues. Important: To use the test banks below, you must download the TestGen software from the TestGen website. If you need help getting started, read the tutorials on the TestGen site.